The quality of Internet connection in Kyrgyzstan is a question that interests many terminators. In spite of the low standard of living in Kyrgyzstan, connectivity to the global network is quite good. According to statistics, as of 2015, of the 6 million people, the Internet is used by about 4.75 million people. The largest ISPs are Kyrgyztelekom, AsiaInfo, E-Cat, Fast Net, Megaline and others. There are 69 companies that provide Internet access services. Most providers offer wireless connectivity and "TV + Internet" services. Those who wish to install GSM Voip-gateways should take it into account as termination requires high-speed internet ADSL, DSL, and Dial-UP. Providers that make it possible to connect to these technologies are Kyrgyztelekom, Saima Telecom, Sapatcom, and JET. The first of these is the leader of the wired Internet. It owns 78% of state ownership in the country and 60% of fixed communication channels, including connections to the World Wide Web. And this is more than 320 thousand users of the wired Internet. The remaining ISPs account for only a small part of the connections, about 20% of the market. 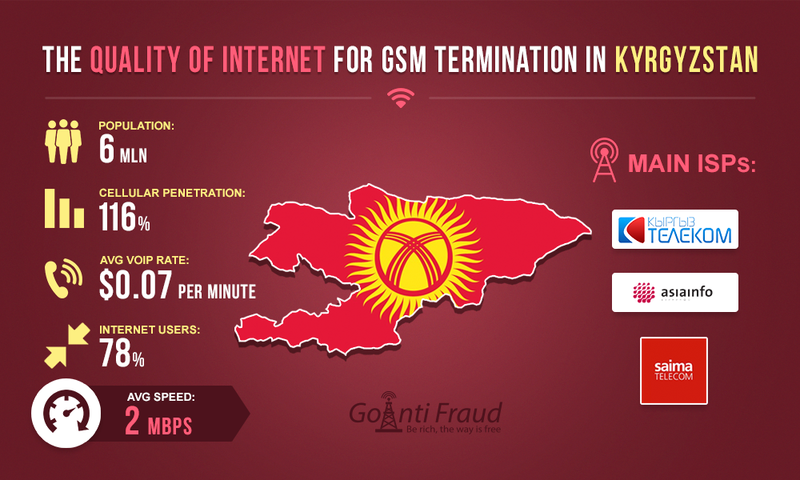 The average speed of the Internet in Kyrgyzstan is up to 2,048 kb/s, which is sufficient for a successful termination of voice traffic via GSM gateways. In addition, the quality of the internet is excellent, especially in Bishkek and major cities of the country. Successful VoIP termination in Kyrgyzstan is possible even when you are using the multichannel equipment. Optimal tariff plans for internet connections are “Intel-X” from Saima Telecom, “150” and “ADSL Standard” from "Kyrgyztelekom". The first package includes a mandatory $0.86 fee per month. When you connect to “ADSL Standard, "Kyrgyztelekom" provides up to 150 hours of access to the Internet a month. This means that traffic can be terminated for 5 hours a day. “ADSL Standard” provides for the accrual of 5GB external traffic all over the world, and 9 GB of internal traffic within the country. That makes 13 GB per month for as little as $17.55. The average voip price per minute in Kyrgyzstan is $0.07. Using the best packages for local calls and internet connections, you will be able to earn at least $1,000 a month terminating traffic.